Learn troubleshooting tips and tricks about the Aquabot Turbo T-Jet robotic pool cleaner from the the expert pool staff at The Pool Factory. The Aquabot Turbo T-Jet‘s simple and reliable design of a pump and filter on wheels makes it a self-contained mobile swimming pool cleaner engineered for long-term, virtually maintenance-free performance and reliability. This revolutionary Aquabot T-Jet designed robotic pool cleaner cleans, scrubs and vacuums your in-ground pool in one hour. Refer to the troubleshooting suggestions below if you are having any concerns with your robotic pool cleaner. Check to see if the Filter Bag is thoroughly clean. FYI: The Fine Filter Bag is capable of filtering particles 20 times smaller than the naked eye can see. Therefore, thorough cleaning of the bag may be required! NOTE: Use the Fine Filter Bag to trap smaller debris such as algae, bacteria, sand and silt. Use the Mesh Filter Bag to trap larger debris such as leaves, acorns, twigs and pine needles. It may be necessary to rinse with high-pressure water and wring the Filter Bag in a bucket of clean water. Rinse, wring, and squeeze dry – repeat until the rinse water is clear. Check to see if the intake valve flaps on the bottom of the cleaner are free to open and close. These flaps should move easily to allow the entry of water and debris. If you are not satisfied yet, remove the bag, reinstall the Bottom Lid (without the Bag), and run it in the pool. If the cleaner moves quickly, this is an indication that your Bag is not clean enough, and you must repeat the cleaning instructions until the Bag is clean. Check clear vinyl tubing for obstructions, or blockages. Remove the Bottom Lid Assembly. Then remove the tubing from the pump housing by gently pulling the tubing from the pump. The tube is not glued in place. After the tube is removed, you can clear blockage by running water through the tube using the pressure from a garden hose. Be sure to replace the tubing securely. Adjust the timing cycle on the Power Supply so that the robotic pool cleaner reaches the other side of the pool and remains there for approximately 2 seconds before changing direction. Check to see if the wheel rotation and axle movement is free of obstructions like hair, string and/or accumulated debris. Check to see if the Floating Cable has adequate length to reach all sides of the pool and is not tangled, or hooked, as this will limit the movement of the cleaner. 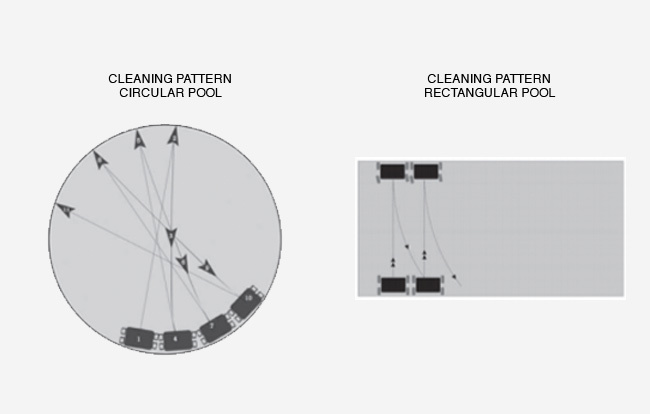 The diagram below shows the normal cleaning pattern for the Aquabot robotic pool cleaner. Take a garden hose with high pressure, spray into the Valve Housing at each Valve Port opening. This should free the Jet Valve System of any debris. If this does not solve the problem, there is most likely debris wrapped around the Propeller beneath the Jet Valve or between the Valve Flap and the Valve Housing wall, proceed below to “Cleaning The Propeller”. Remove valve outlet (2 horizontal screws). Bend a common “giant” paper clip into a hook as shown in and push the center flap of the Valve Housing with your finger to open it and look into the Propeller. You may find debris like hair, string, or a small twig caught in the Propeller. Use your paper clip to hook or free the debris, and remove it as shown in. Turn the Time Control Dial (located on the Power Supply) clockwise a few degrees to increase the time between reversals. Repeat if necessary. Check to see if the Filter Bag is thoroughly clean and installed properly. Turn the Time Control Dial on the Power Supply counter-clockwise a few degrees. Repeat if necessary. Your new robotic pool cleaner was designed to clean most pools without issue, but some pool shapes may cause the Floating Cable to coil, or tangle. This cleaner operates in a systematic cleaning pattern that varies in nature. This may cause the Floating Cable to twist. For this reason we have added a new feature to your cleaner. This patented feature will allow you to untwist your Cable easily. Disconnect the Power Supply Cord from the Power Supply, place your cleaner on the ground outside of the pool perpendicular to you. At the end of the Power Cable, located near the connection plug to the Power Supply, is a plastic handle. Grab the handle firmly and walk away from the cleaner while pulling the handle. This will cause the Cable to rotate within the plastic handle and force the Cable to untwist itself. For best results remember to pull the handle until the Cable is completely untwisted. Customer Spotlight – John T.
Aquabot wont climb to top of liner even when bag totally clean Help! The Aquabot T-Jet will only climb to the top of the pool wall occasionally. If you would like your cleaner to spend more time at the waterline you can try this simple trick that a lot of owners of robotic cleansers use. Tape a Styrofoam block or two to the bottom of the inside of the lid. 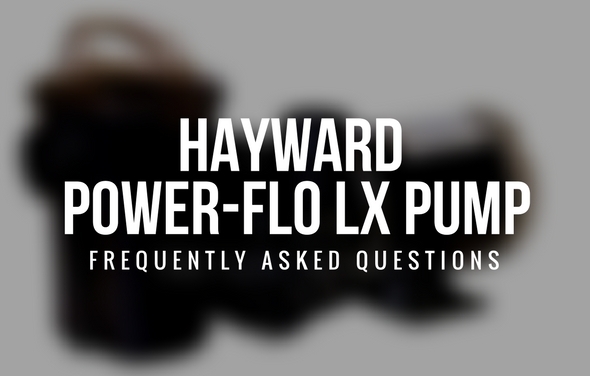 The amount of flotation used will have to be adjusted until you are happy with the performance.